» Why I’m Attending Interaction 09, and You Should Too! December 12, 2008 | Comment? Last weekend, I attended and spoke at CyborgCamp. It was a helluva thing. It’s incredibly energizing to get a bunch of smart and thoughtful people in a room together for a day to talk about the intertwinement between people and technology. Ward Cunningham was a joy to watch and see how he visualizes massive data. Lia Hollander spoke passionately about her bond with her insulin pump. And I could watch Hideshi Hamaguchi diagram on a whiteboard all day long. The biggest thanks of all go to Amber Case, Bram Pitoyo, and way more for conceiving CyborgCamp and pulling it off. When’s the next one? My own talk surprised me. It came together frankly in the few previous days, but I like the angle. However, it led to a discussion that I really loved and had not expected: how various people use the symbols of our common punctuation to mean different things. And the possibilities for what else they can mean. You can view the talk at blip.tv. You may need headphones during the post-talk discussion to hear the !me part of the conversation. Thanks a ton to Blaze Streaming Media for the stellar video work. For some background on what led to this conversation, here is the essence of my talk, titled “Is Machine Language Extending Human Language?” The characters that we use in written language had been evolving for thousands of years, from pictorial drawings that represented the simple nouns of our prehistory lives to the abstract letters of our various alphabets and character sets that we have today. But technology halted this evolution. The printing press constrained the evolution of written letterforms. The typewriter chose winners and losers of our symbols, essentially saying some letters and symbols are more important than others. The computer forced a standardization of the character set. The ASCII table fixed this character set in place. We will never have a 27th letter (in the English alphabet). Can you imagine the infrastructure overhaul required in all the software and keyboards? However, language always wants to evolve. It has to. We communicate so much that language must mutate over time. But we were hampered a bit by the fixed character set we were forced to use from the computerization of communication. So we found ways to evolve language by adding new meaning to existing symbols, either individually or in combinations. A classic example takes two dry punctuation symbols and mashing them together to get something new. On their own, the : and ) serve utilitarian purposes. But mash them together to :) and you have an entirely new meaning, a smiley face, happiness, etc. Joy. The two major symbols I spent time on tracing their history were @ and #. The @ sign through most of its history meant Each at. It was a commerce term. “Apples 10@.49″ It survived the typewriter cut by being placed as a shift above the 2, a position it still holds today. Then the Internet showed up. In 1971, when Ray Tomlinson was writing the first email system and needed an addressing system to send a message between two computers in the same room (but via Arpanet). He needed a separator between the name and the location. Oh, @ works perfectly. The @ symbol then adopted a new meaning: Location. In fact, the @ symbol is so strongly identified with Twitter identities that only saying “@billder” is enough of a way to contact somebody. The @ symbol then adopted its current meaning: Identity. Pound sign, number sign, hash. The main two meanings of the # sign prior to the Internet were either number or pounds. Essentially, # meant Quantity. But again, Twitter provided a way for this symbol to evolve. Early on, people recognized that people talked in topics and desired a way to track certain topics. Chris Messina then proposed using the # symbol to mean “topic.” It worked. People used it, and software developers responded to this organic evolution of the # sign and built tracking functionality. Voila! Then the discussion opened up to, what would you do with the following symbols? Do you use these symbols already? What do they mean to you? What potential uses do you see for them? I was blown away by the creativity of responses, both how they currently use them or could potentially use them. I wish I could credit everybody with their suggestions, but I didn’t know everybody and the conversation was moving fun and fast. Here are the ideas we came up with. Of course, some are simply funny, but some had some serious meaning packed into them. Would you use any of these in your writing/communication? The tilde (~) started it off. Normally it’s a diacritic above characters to indicate change in pronunciation, mostly commonly in Spanish and Portuguese. But it’s mathematical sense of approximation seemed to be the theme, i.e. ~50 means “about 50″. ~ To indicate dating. Bob~Mary means that Bob and Mary are sorta dating, just hanging out. Of course, Liv=Mel means they’re married. Was engaged ~~? ~ When writing a list of things to do, ~ indicates something started but not quite finished. ~clean office. ~write this blog post. It’s approximately done. ~ means Approximate. I am ~French-Canadian. It is ~raining. The exclamation point (!) or “bang” didn’t generate much interest. It’s already used to mean emphasis, dammit! It did used to mean “route” in early Unix UUCP days, used similarly to @ today. The typical wow! usage of the exclamation point is a bit opposite from its mathematical sense of “not” or “false”. It goes from extremely positive! to !negative. The Earth is !flat. George Bush is ~!President. The caret (^) is another diacritical used in a lot of languages above vowels to indicate different pronunciation. Way too many examples to dig into. It also has the math meaning of power. 2 multiplied by itself 3 times is 8, 2^3=8. All math symbology is highly condensed shorthand to convey complex relationships. One person in the crowd uses ^ to conjoin disparate ideas to see what happens. Take any two words. Digital. Vegetables. Now conjoin them, digital^vegetables. It’s a way to invent ideas. In fact, it’s similar to a great sci-fi book called The Futurological Congress from Stanislaw Lem wherein futurologists combine words to discover new ideas to predict the future. The caret even looks like it’s joining^words. It’s two little arms connect each word and then points up to ask, this + that = what? ^ means Conjoin or Juxtapose. Belgian^piston. Wool^clock. Symphony^party. Touchscreen^cat. I then brought up five obscure symbols found in the extended Unicode character set. This part of the discussion was meant to be a throwaway. All I did was, the night before, dig into Special Characters in Keynote, thought “this one would be funny” and inserted it. In fact, I had the animation set up to automatically display each one for a couple of seconds, which wouldn’t have allowed discussion. On a whim, half an hour before my talk, I killed the animation. Glad I did, because some interesting stuff popped up. Snowman with a Fez probably generated the most hilarity. And why not, it’s a snowman with a fez, or at least that’s what I saw. Somebody else saw Spicy Food for Gringos. In general, it’s a wtf? Ever seen a snowman in the desert? This this really isn’t possible. So, it’s an oxymoron, a non-sequitur, a wtf? “Dude, you’re being a snowman with a fez.” Can it be a symbol of sarcasm, maybe even replacing <sarcasm> HTML tags? The knight is a chess symbol, indicating, well, the knight. First idea, transportation. Sure, but a bit literal. “Condoms available here.” Wow. But then somebody threw out the gem. It’s a threat. A classic Mafia I’m going to leave a horse head in your bed threat. Perfect. So maybe being knighted isn’t such a good thing anymore? The musical symbol was generally a happy symbol for most people. It’s music, song, singing. There were a few downer ideas. Painful like a tooth nerve? A redundant person, because they’re a one noter? But it’s a happy symbol. It’s sometimes used with statements to add a Wheeee! quality to it. Wheeee! The sun is shining! Finally, a hand holding two fingers up. It’s simply the number two. Or most commonly, Peace. I’m not a crook. Breeding like a rabbit. But with two of them, used in pairs to surround a word or phrase, AIR QUOTES. Did you ever think that punctuation can be interesting? Everything surrounds us has a story. Even the most common symbols of our language. Especially them. If you made it this far, you may enjoy a book (that I haven’t read) about the dot, the period. On the Dot: The Speck That Changed the World . What could be more pedestrian, yet more universal? So where does language go from here? How does it change when touch, gesture, or other means of communication become more common? Do we return to a pictorial symbolic language? 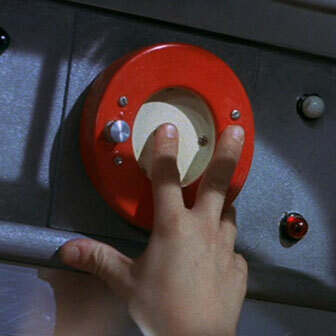 Push Click Touch evolved from the blog History of the Button to encompass a wider range of experience design topics. Your host: Bill DeRouchey (@billder on Twitter). I am co-chairing Interaction 10, the annual conference hosted by IxDA. Learn more at interaction.ixda.org! Why I’m Attending Interaction 09, and You Should Too! Copyright © 2010 by Push Click Touch All rights reserved. Powered by WordPress. Theme evolved from Upstart Blogger.